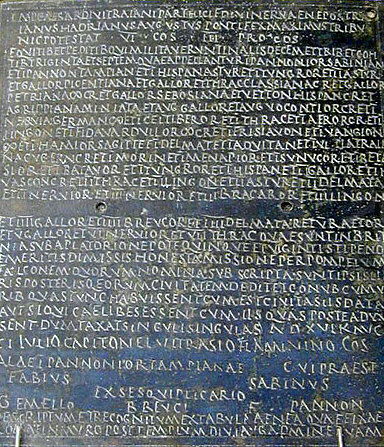 Diploma, detail, dated July 17, 122 C.E., granting citizenship to Gemellus, an auxiliary serving in Britain, after 25 years of military service, bronze, The British Museum, London (Photo by Barbara McManus). courtesy of the VRoma Project. If you are interested in qualifying for a Latin Teaching License (formerly Certificate) to teach Latin in secondary schools in most states, first contact Professor Patricia A. Johnston, who can share language course requirements with you. The Department of Classical Studies collaborates with the Education Program on Latin teaching licensure. For more information or to choose your licensure course requirements, contact Marya Levenson, director of the Education Program. If you are interested in talking to a student who is working toward a Latin Teaching License, please contact Ann Koloski-Ostrow.